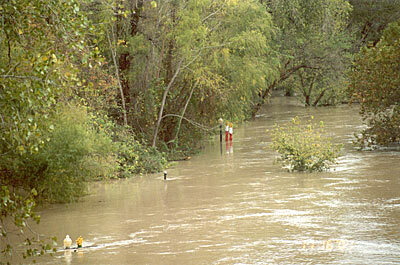 On November 16, 2001 the Colorado River flooded after heavy rains throughout Central Texas. Rains up to 14 inches hit the Austin area. 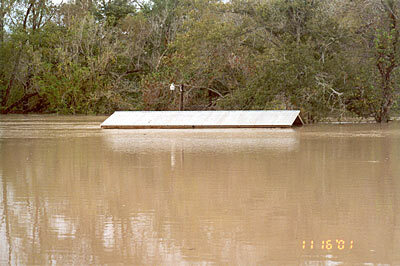 The Colorado River then rose and crested at Bastrop at a level of 30 feet--5 feet above flood stage. Sitting high above the river, the city of Bastrop received little damage; however, Fisherman's Park and the Riverwalk were flooded overnight. 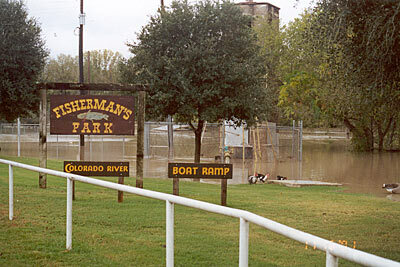 Since Fisherman's Park and the Riverwalk are adjacent to the river, both were built to withstand flooding and escaped with minimal damage. I personally walked the Riverwalk several days later and am happy to report that both are back to normal. 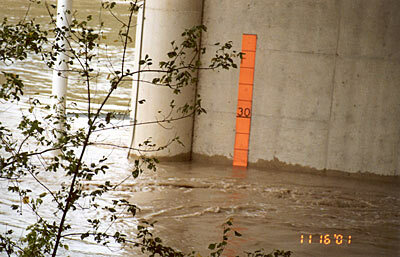 Following are some scenes of the flood. The Colorado River rises to 27 feet--later overnight to crest at 30 feet. The small Pavilion at Fisherman's Park located next to the river. Scene near the main Pavilion at Fisherman's Park. 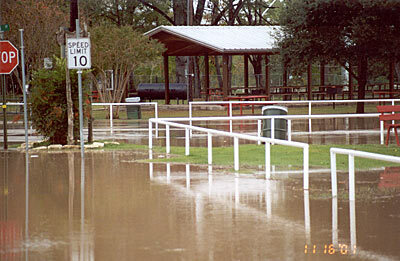 Scene at the Bastrop Riverwalk--note the tops of the light poles.